Edition 35. Signed, dated, titled, and numbered 11/35 in pencil. Annotated Sekishu (Japanese paper) in pencil, lower right sheet corner. Image size 5 1/2 x 6 inches (140 x 152 mm); sheet size 9 1/4 x 8 5/8 inches (235 x 219 mm). A fine, rich impression, on cream wove japan paper, with full margins (1 to 2 1/4 inches), in excellent condition. 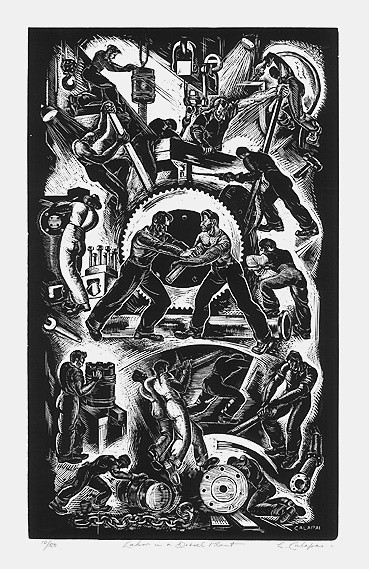 Labor in a Diesel Plant ---1940, Woodcut. Edition 50. Signed, titled, and numbered 10/50 in pencil. Signed in the block, lower right. Image size 15 3/4 x 9 1/2 inches (400 x 242 mm); sheet size 18 x 12 inches (457 x 305 mm). A fine, black impression, on cream wove paper, with full margins (1 1/16 to 1 1/4 inches), in excellent condition. 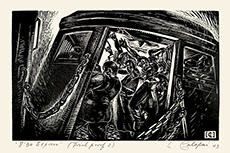 Reproduced: The American Scene on Paper; Prints and Drawings from the Schoen Collection, Georgia Museum of Art, University of Georgia, 2008. 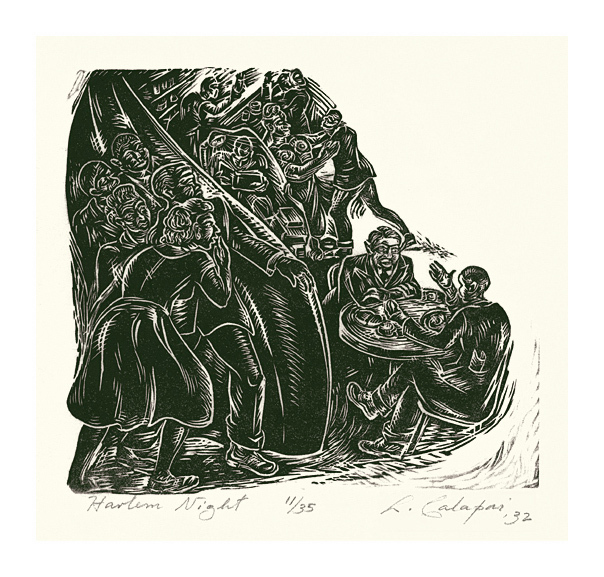 Edition 27, a trial prrof before the edition. Signed, dated, titled and annotated (Trial Proof 3) in pencil. The artist’s monogram in the block, lower right. Image size 5 3/16 x 8 1/2 inches (132 x 216 mm); sheet size 10 x 12 7/8 inches (254 x 327 mm). A fine, fresh impression, on cream wove paper, with full margins (5/8 to 1 5/8 inches), in excellent condition. A fine, rich impression on cream laid paper, with full margins, in excellent condition. Printed by the artist. Calapai experimented with different papers, and on this impression he has written “On Casinensis ivory laid – Made in Italy”. 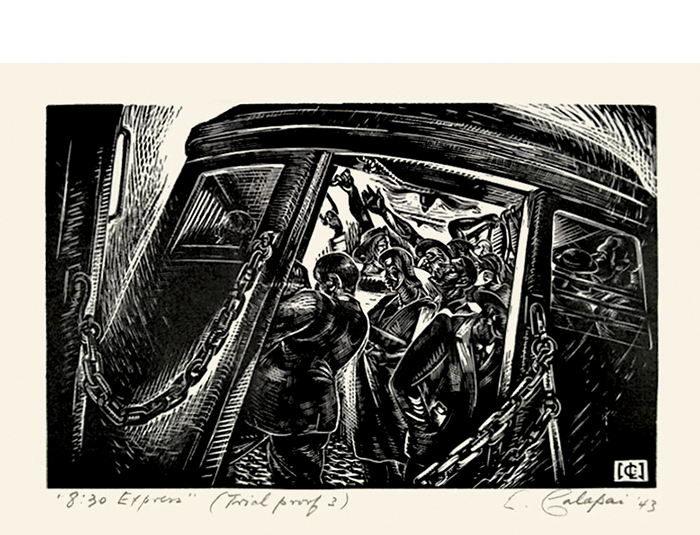 Reproduced: L’Amérique de la Dépression: Artistes Engagés des Années 30, Musée-Gallerie de la Seita, Paris, 1996; The American Scene on Paper; Prints and Drawings from the Schoen Collection, Georgia Museum of Art, University of Georgia, 2008. 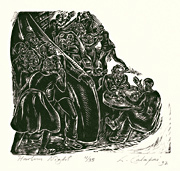 Exhibited: L’Amérique de la Dépression: Artistes Engagés des Années 30, Musée-Galerie de la Seita, Paris, 1996-97; The American Scene on Paper; Prints and Drawings from the Schoen Collection, Georgia Museum of Art, University of Georgia, 2008. Collection: Crystal Bridges Museum of American Art.